An artificial intelligence and robotics expert at MIT in USA, Deb Roy, tried to develop a robot that could learn the same way kids learn by trying to understand the workings of the infant mind. He and his wife, Rupal Patel, an eminent speech and language specialist, set up cameras and recording devices that recorded 85% of their little son’s first 3 years. Much of this explored the miracle of how babies learn to talk. Deb Roy was ‘blown away’ by the incredible sophistication of what a language learner, in the form of a small child, actually looks like, understands and does. So what does this mean for parents? The time you spend with your little ones is precious indeed – it’s an investment into his or her future. Every experience in his little world is a learning opportunity, even the mundane daily routines of bathing, dressing and eating. Use the precious time you spend with your little one every day for a fun time of shared pleasure. The Worcester libraries are most supportive of the early learning workshops for ECD centre and playgroup teachers sponsored by RCL FOODS. They provided information on holiday activities for young children, book marks for readers and all the information needed for people to join and access the wonderful reading resources available free of charge for Worcester parents and children. Zwelethemba Library even hosts a toy library with staff trained on how to use all the learning resources. Do join your local library! 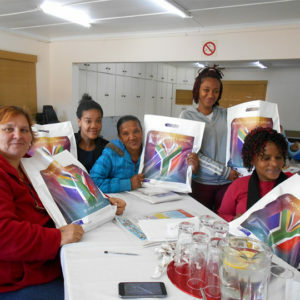 The early childhood teachers and playgroup facilitators attend monthly Wordworks ‘Every Word Counts’ workshops facilitated by FCW and sponsored by RCL FOODS.